Live Action goes mobile in its 11th edition. From August 19 to September 10 2016, one of Europes’ leading performance art events, will present artists from all over the globe in Gothenburg as well as Borås, Skövde and Trollhättan. Live Action’s line-up this year will include artists from USA, Cuba, China, India, United Kingdom, Italy, Poland, Norway and Switzerland who will show us live what art can be in our common space. After last years successful 10th anniversary celebration of Live Action, featuring a major photo exhibition Live Global at the Gothenburg City Library, a series of lectures Live Talk, and during five weeks, the experimental durational strand Live Time, Live Action continues its 11th edition to explore new paths in performance art. We will continue the successful durational strand, Live Time, while introducing a new theme in Live Mobile investigating mobility, one of the fields main characteristics. In problematizing mobility Live Action continues its stated objective to consciously trigger the understanding of performance art. Of course, no one can showcase more profoundly than the artists themselves how to conceive and embody mobility. They all think and work differently, comes from diverse backgrounds and cultures, bringing with them their various experiences. This 11th festival is implicitly different from the previous edition, in that we for the first time leave the white box, the art institution, in presenting also our evening program in our common public space. Besides this structural change of the event design, we are very pleased to be able to present, yet another year, a program with some historically important performance artists alongside a number of reknown and emergent artists from around the globe. 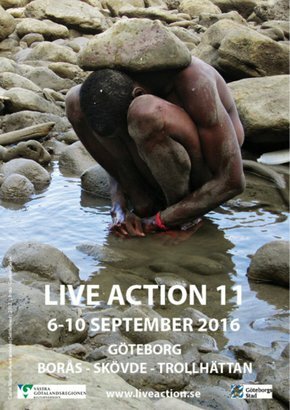 Since its start 11 years ago Live Action have showcased outstanding international artists. With its stressed ambition to formulate a public cultural democracy that gives everyone access to contemporary experimental art, Live Action is an opportunity for anyone to come and explore intriguing visual artists from around the world. This year again we are ready to answer the recurrent questions : what is he/she doing ? What does it mean ? The answer will, of course, be the same. Think by yourself, believe in yourself, in your own imagination. Empower your mind !